She told a story of an experience she had a few years prior where her husband had been pretty involved in playing the world’s most popular Massively Multiplayer Online Role Playing Game(MMORPG)called World of Warcraft (WoW). If you haven’t heard about the success of WoW then all you need to know is that over 11 million people pay a monthly subscription to play this online game - the revenue is astounding and it speaks to the quality of the game experience! Mary Anne’s husband would constantly try to convince her to play WoW with him. As a non-game player, Mary Anne could not really understand the appeal of the game. For example, one week she would come into the computer room and her husband would be playing the game. His character in the game would be in the middle of a quest busily fighting wolves for example. Then she would come into the computer room a week or two later and her husband’s character in the game would be still doing similar things – only this time he was fighting bigger wolves. The attraction to the game for her was not clear. However, after some time she finally got tired of his pleading and made him an offer he couldn’t refuse: she would play WoW with him for the summer when she wasn’t teaching. It didn’t take long for Mary Anne to finally understand the attraction of WoW once she started playing. She describes it “an immersive experience” where you begin to feel like the character you are playing in the game is an extension of yourself. WoW challenges players to make their characters perform heroic acts, great feats of courage, and overcome challenging tasks in the game and you can do all these things by yourself or with the assistance and collaboration of other game players. The social interaction between players while playing WoW is a very interesting and engaging facet of the game. In fact, the entire experience of playing the game is a very large exercise in learning. 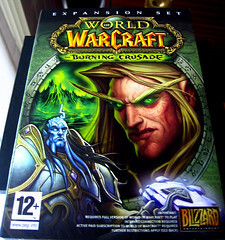 As a player, you have to learn the etiquette of WoW, you have to learn how to complete tasks, learn how to improve your character’s skills, learn how to interact with other players, learn how to make money to outfit your character’s needs, learn about the monsters you will be combating, etc. All the while, you receive immediate feedback from the game in the form of virtual currency, precious items and even the enhancement of your “in-game” reputation among other players – all highly motivating features that encourage game players to continue playing. After some time, Mary Anne realized that with so much learning going on by WoW players, wouldn’t it be convenient and spectacular if WoW could be used as a teaching tool in her academic field. Unfortunately, her academic field was not “Monsters”! That’s when she turned to a different virtual world product: Second Life. 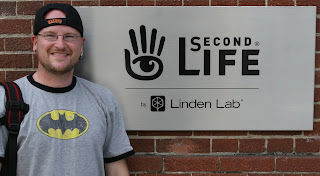 I’ve written about Second Life a few times before on this blog (here and here). Mary Anne began developing what would become today Genome Island. 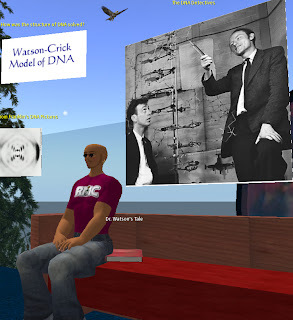 This location in Second Life now hosts many learning objects and activities that augment introductory courses in genetics and biology. Much like WoW, students create a virtual character in Second Life and with this character they can personally interact with objects and perform the learning activities that Mary Anne has created. They can conduct virtual experiments and collect the data that they produce. Consequently, after conducting the experiments, students can summarize the data in a convenient way (such as an excel spreadsheet or a word document), compare it with their classmates and analyze their findings in a real-world lab report. Genome Island is segmented into four main sections. The Abbey and Gardens deal with experiments and concepts about genetic inheritance patterns. The Tower has learning activities relating to human, bacterial and Drosophila genetics as well as molecular biology. The Gene Pool is still under development and will have models for population genetics. The Terrace overlooks several exhibits demonstrating animal models, etc. Lastly, the Atelier is the ‘sandbox’ for Mary Anne herself where you can occasionally watch her (or her colleagues) in the process of building new learning activities for Genome Island. "The Second Life made activities more hands on, and while we did a lot of reading it never seemed like it." "I love the fact that it is REALLY hands on. It isn’t like sitting in a lecture class, you really end up enjoying all that you are learning and it really makes you want to learn MORE." "By the way this is awesome! I've never done anything like this in relation to science, let alone had this much fun!" The power of virtual world immersion and excursions when applied to a learning context is clear. The challenge is ensuring good instructional design is in place so that students can move past the technical requirements or novelty of using the virtual world software and clearly focus their time on the well-crafted learning activities that these worlds can host. Genome Island is publicly accessible in Second Life. So by creating a free Second Life account and by creating your own virtual character, you can go check out all the learning going on for yourself. While you are on the island, be sure to say ‘hi’ to the character "Max Chatnoir" if you can find her - that’s Mary Anne herself! Do you use Second Life (or World of Warcraft?) in your teaching? If so, tell us your experience by leaving a comment below. Nice story about how Genome Island came to be. It's one of my favorite educational islands in Second Life. I'm a librarian at a small private university in Portland, Oregon USA. I have also taught in SL as an adjunct instructor. Mine is a one credit hour educational technology course for graduate/doctoral education students taught fully in Second Life and titled, "Intro to Second Life for Educators." Basically, it's a course that introduces teachers and principals to the educational applications of Second Life. One of the weekly assingments was to visit Genome Island and write a reflection on our course wiki about the experience. Students clearly saw the value of the immersive environment Mary Anne created. For those who are interested in fining out even more about genome island, Mary Anne just published a nice overview of Genome Island in a recent ediction of Innovate. Check it out here (Free login required).